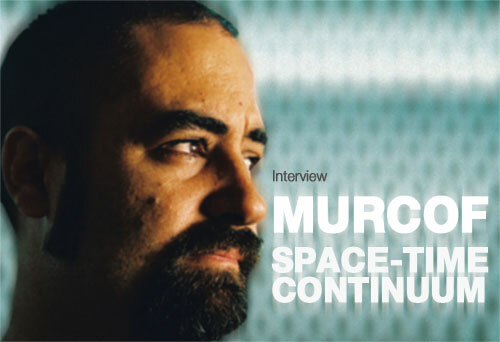 With just a handful of releases under his belt, Mexican electronic musician Fernando Corona, AKA Murcof, has established a very unique sound and is already named as a major influence by some. Five years after his seminal debut album, Martes, was released, he is back with his magnificent third album, Cosmos, on Leaf. For this latest effort, Corona pretty much ditches the micro beats and samples that have informed previous releases to work from recordings of real classical instruments. The result is a superb tapestry of sounds, drones and melodies which Corona will take on the road for a planetarium tour in the autumn. Here, Fernando Corona talks to the themilkman from his home in Barcelona, where he currently resides, about the new album, his soundtrack work and the rise of the Mexican electronic scene. Fernando, first thank you very much for accepting to do this interview for the re-launch of themilkfactory. It’s been nearly two years since Remembranza was released. What have you been up to? Hi there, well, I’ve been up to many things; I’ve done a couple of film soundtracks, travelling quite a bit and enjoying life in Barcelona, where I live now. And in my spare time I’ve been working on Cosmos until I finished it a couple months back. I actually started working on it almost right after I finished Remembranza, but it took me a while to finish it. When I first interviewed you, Martes was just about to be released. Since, it has sold quite well and has established your name on the electronic scene. Have you been surprised by the reception the album received? Of course, it was a very welcomed surprise, and now I’m here in Europe because of that, basically, not sure for how long though. Your second album, Remembranza, seemed a lot more introvert than Martes, with less beats and more complex melodies. Was that a conscious move from you? I knew at an abstract level that I wanted to do something different from Martes, based on the same aesthetic principals but taken to another level. It was not until I started working on it that I noticed it was becoming a bit more complex, melodic, harmonic, structure, rhythmic and content wise. I guess my life too was a bit complicated back then. Remembranza was rumoured to be released with a DVD surround sound version but it was never released. What happened? We did do some tests but it wasn’t working like we wanted it to, something was missing, so instead of forcing it we ended up reverting to CD. Someday I’ll make a DVD release, but it has to be organically conceived. For your new album, Cosmos, which is released in a few weeks time, you seem to have changed the way you work quite considerably. The album sounds a lot ‘bigger’ than your previous recordings. Can you tell us how you worked on the new album? As all my previous works, it was an organic progression rather than a planned one. I felt the need to depart a bit from traditional electronic/techno music, song structures that would allow me to express new things I wanted an output for. This is not quite as clearly obvious on tracks like Cielo or Cometa, but most of the album does have this new freedom of structure, inspired by classical music structures. I ended up with tracks like Cuerpo Celeste, Oort, Cosmos 1 and 2. Cosmos was apparently originally set to be an EP. How did it evolve into a full length album? The idea of upgrading to an album mainly came from Leaf, and I am very happy we took that decision. It started as a four-track EP and later I added two more tracks with a similar intention, the two tracks I added are the last two tracks on the album. You regularly play live. How do you performances differ from the recordings, and which environment do you feel more at ease with? It’s increasingly difficult to add much interactivity to my live set, specially for Cosmos, so at the moment, I am finding a way to both maintain more or less the original intention of the tracks while adding some flexibility and interactivity to make it more fun. And as for environments, I obviously prefer silent ones, that way people can appreciate the more subtle elements of the music. They are happy and I am happy. There’s no sense in playing in club or noisier environments, unless that’s the initial intention or it is viewed as a necessary component. You started by releasing music on Static Discos, which I believe you co-founded, before signing with Leaf. Do you still get involved with the label? More or less. I have disconnected a bit from the label to concentrate more on my work, but they know I am here when they need me. I still help with mastering and producing once in a while, and I landed a hand to Fax with a couple of gigs when he came to Europe last year. Do you see being involved in producing, mastering and remixing as an important part of your work as a musician? I’m not remixing much anymore, I find it increasingly difficult, but Fax is very prolific in that area. Of course when possible I do the occasional remix or production, because I truly believe in the new Mexican generation of musicians and we do this as a form of support. This new generation of Mexican electronic artists and labels is very active in Mexico at the moment, although they remain pretty unknown over here. Do you think your success outside of Mexico has helped to raise the profile of the Mexican electronic scene? I’m sure my case has shifted some attention to Mexico, there are a lot of unknown talents who deserve to be heard and whom people deserve to listen. A lot of very good net labels, like Mandorla, Cyan, Umor Rex, etc. It’s a matter of time and perseverance for them, to begin to be heard outside of Mexico, which they slowly are. Your work seems to have inspired a few artists in recent years, with people like Deaf Center, and more particularly Erik Skodvin, with his own project, Svarte Greiner and the releases of his label, Miasmah. Are you aware of these, and how do you feel to know that your music influences other artists? I know Deaf Center but not Erik. Yes, I am aware of my influence, some people have made it clear to me that I have influenced some of them, which of course is flattering, and more so when they take it to another level, when they add their own personal signature. One of the main reasons I do music is to transmit inspiration the way I receive it from other musicians, or from any other source for that matter, but as raw energy to be later sculpted in whatever form they wish. When I first interviewed you, you said that you mostly work alone because you’re too obsessive, although you collaborated with Nashio Chavez, AKA Planktonman, for a couple of releases as Terrestre for which you each supplied about half of the tracks. How did you get to work with him, and did you actually collaborate on the music or was it more like split releases? Are you planning to release more music as Terrestre following the releases with Planktonmnan and your Secondary Inspection album? Not sure when or how, but I’m sure I will, sooner or later. There have been a few videos made on your music, notably for Ulysses, Rostro and Memoria. Do you get involved with video artists when they work on one of your tracks? Not much, once we agree to work together I tend to let them do whatever they want and feel. I might have some suggestions and give an idea or two, but sometimes it’s better to let it go and see how it comes back to you. You’ve recently produced the soundtrack for a Mexican movie called La Sangre Illuminada (Enlightened Blood). How did you get involved with the project, and was the approach to this very different from your usual work? It happened through a very good friend of mine from Mexico City with whom I have worked with in the past. He is Herminio Gutierrez, one of the most important music supervisors in the Mexican movie industry. He presented my work to director Ivan Avila and the rest was pure love. Are you planning to release it as an album? Yes we are, currently working on it. There is no specific date though, but it’s looking like early 2008. Do you thing you will be working on more soundtracks in the future, and if yes, what kind of movies would you like to work on? Well, movies with content, no specific style, as long as I really feel I can bring something good to the project and that the film communicates to me and facilitates the creative process. I’ve got a couple of commission projects in the pipeline. I am currently doing some research for one of them which we will disclose as we have more solid info. We are also preparing for a planetarium tour in Europe for the release of Cosmos for autumn/winter 2007. There is another Mexican film in the near future as well, this time a thriller based on a fictional town in the Baja desert. I remember reading this when it was first published, but it’s just as interesting now.. Thanks for keeping all your material online, I keep coming back to so much of your writing. Murcuf continues to impress, and it’s great to see his evolving steps in time.